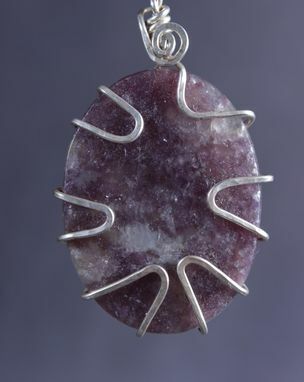 Lapidalite or lithium queen mine is known for its healing properties. I found this precious stone in one of my walks in the desert. This beautiful stone has an intense purple shade, due to the natural process of mineralization. To enhance and highlight its color, I hand polished it and then wrapped it with a hammered silver wire. This 2-inch long and 1 1/8-inch wide pendant can be worn with any of our silver necklace pieces.